The residents of Pery Square in the early 19th century were the most prominent and influential members of Limerick society of the time. 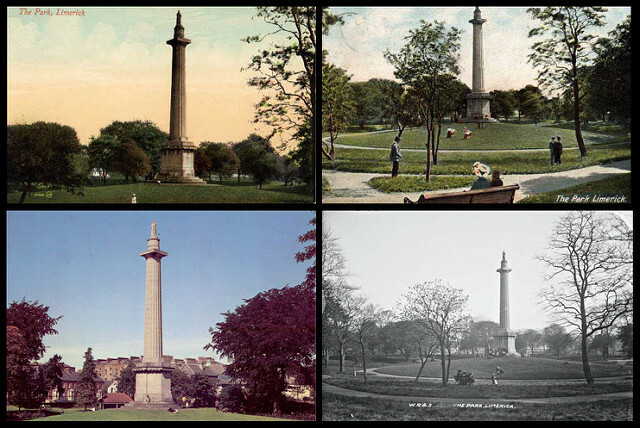 The square and park were developed by the Pery Square Tontine Company, an idea of Matthew Barrington, the company included other notable names such as William Sexton Pery, Thomas P. Vokes, James Pain. The residences were completed in 1838 and the associated park was a key-holders only park. The intended plan was to surround the park with housing for the more affluent members of society but the funds for the project ran out before this could be completed. 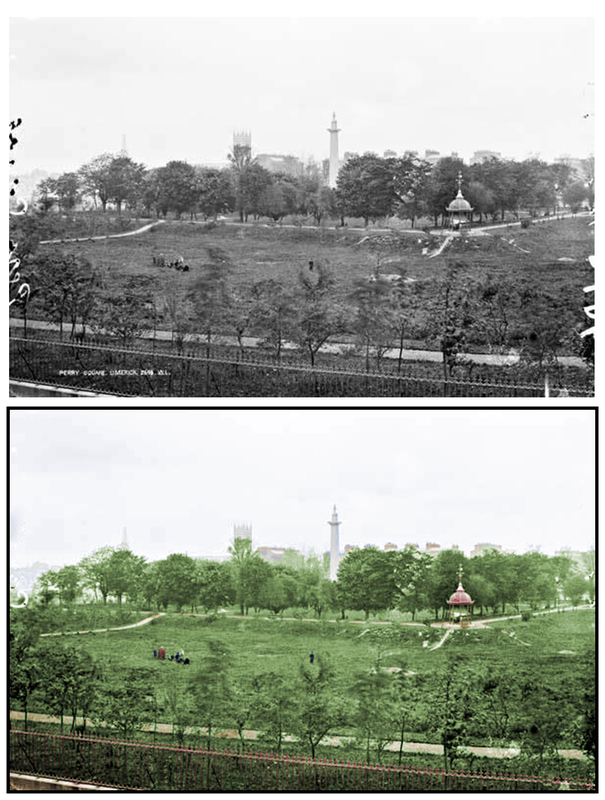 It was not until the 20 August 1877 that The Park at Pery Square became the public park known as People’s Park. The public park was dedicated to the memory of Richard Russell, a prominent local businessman and was opened by Major Spaight. The main entrance gate includes the memorial inscription to Richard Russell. 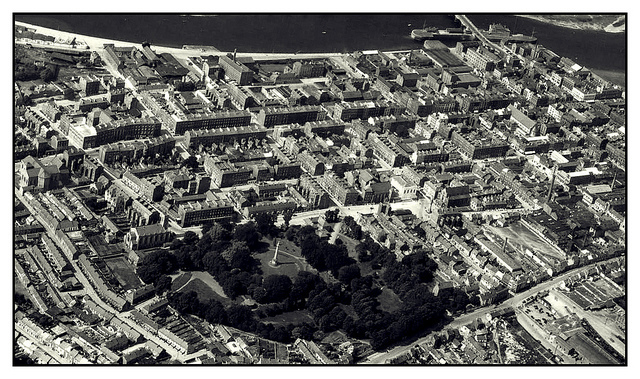 ‘Pery Square. This public park was formed by subscription. In memory of Richard Russell the land being given by the Right Honourable. The Earl of Limerick’. It was the then Earl of Limerick in the 1870s who granted a 500 year lease of Pery Square and the surrounding grounds to the corporation under certain conditions. These included an agreement that no political or religious meetings were allowed to be held in the park and bands were not to play there on a Sunday. It was not until 1903 that the iconic Carnegie building which now houses the Limerick City Art Gallery was built, the recesses of the foundation stone contain 4 bottles, which contain the currency of the day (1903) as well as a copy of the Limerick Leader, Limerick Echo, Limerick Chronicle, Munster News and a parchment recording the event. Standing in the middle of this quiet leafy square, is a free-standing limestone column erected in 1829 by the Barrington family topped with a statue of Thomas Spring Rice (1791-1866), gives a sense of the aspiration of grandeur of the newly fashionable part of Limerick. Thomas Spring Rice was still alive, an MP for the city, with a government post, and a landowner in County Limerick when the statue was erected. He was extremely popular in the city. He was later 1st Baron Monteagle of Brandon, County Kerry. ‘Thomas Spring Rice M.P. for the City of Limerick 1820-1832’. In 2004 there was major controversy as it was seen that the terms of this agreement were broken with the building of an apartment block on the park grounds. The park also contains a 19th century Bandstand, an ornate drinking fountain, also dedicated to Richard Russell, which was restored in 2009 and two gazebos. What I would love is if they knocked the boarded up buildings next to the railway station so Jackman Park could be seen and expand the park to include the green space outside the park. Re: In 2004 there was major controversy as it was seen that the terms of this agreement were broken with the building of an apartment block on the park grounds. how did they get away with doing this when there was plenty of room across the road? is there any chance in the future the road and the grass outside the park being converted in to extra park space? would look nice to new visitors to the gateway to limerick city. I wonder if I can get a copy of the agreement regarding the lease on the Park on the Park.